With all your favorite agars and carrageenans! When it comes to foreign cuisine, no supermarket chain kills it quite like Trader Joe’s. 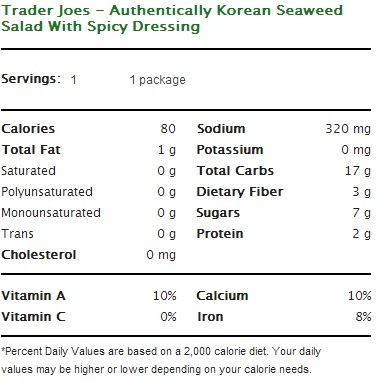 Case in point – Trader Joe’s Seaweed Salad with spicy dressing. We’ve already looked at some of TJ’s bold, if shaky, forays into the Korean kitchen. With this fun spicy salad they can proudly boast that they’ve done something well that no one will appreciate. 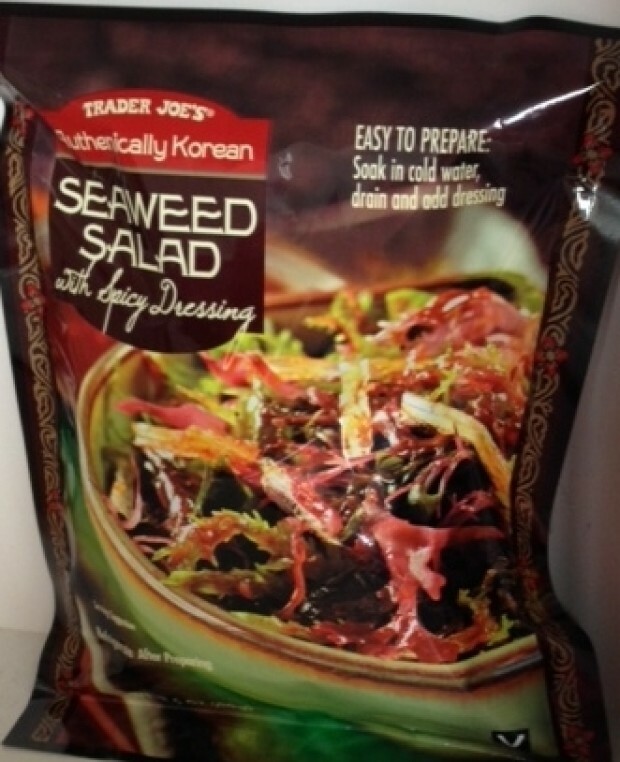 Yes, absolutely, this sea weed salad does – if you’re in the market for authentic Korean cuisine. If, instead, you’re looking for a nice, ordinary salad to accompany your casserole, try one of these. If, on the other hand, your on the hunt for an entirely different taste, and texture, sensation to make dinner memorable you couldn’t ask for better. In a lot of ways Trader Joe’s Seaweed Salad is exactly what you’d expect – a big pile of wet, limp seaweed that smells more than slightly of the sea. In other ways though, this salad might surprise you. For one, the salad is actually thrown together from a wide variety of seaweeds. Each one brings it’s own texture, color and toothfeel to the dish, seven different types of sea plants go in, from the translucent agar-agar to the bright Carrageenan Yellow. Eating these fronds is unlike eating any other salad you’ve ever had – large, tender, sometimes slick, sometimes springy textures slide and bounce their way across the mouth with each bite. It doesn’t exactly come packing the taste – few things are as bland and mild and wet seaweed – but what it lacks in taste it makes up for in texture and appearance. Of course, TJ’s was aware that seaweed needs some help to become tasty, and it provides that help in the form of a monstrously large packet of “salad dressing: that is, essentially, a thick, paste of red hot peppers. Again, kudos to Trader Joe’s for taking the authentically Korean route here. Many mass retailers might have tended toward a milder, more edible dressing, instead TJ’s gives you the full-on Korean restaurant experience. This is a seriously hot condiment folks, and it’s given to you in a quantity far beyond what you’ll likely need to enjoy your salad. Try a dab of the dressing first before slathering your salad and adjust accordingly. I found about a 1/6th of the packet enough for me – but as we established before, I’m also a bit of a chili wuss. A final note, making this salad was more fun than it should have been. The meal comes as a freeze-dried thatch that you must dump in a big bow of water and leave to quintuple in size – dinosaur sponge style. It brightened up my day, but then again I am easily amused. Would I Recommend It: Yes, if you think you like seaweed or interesting textures. No to everyone else. Would I Buy It Again: I could see it happening. Final Synopsis: This is a great, exciting, interesting seaweed salad but, ultimately, a seaweed salad it remains. I went foraging at TJ’s for some interesting and nutritious backpacking food last night and this ended up in my cart to compliment a more bland teriyaki noodle dish. I appreciate the caution about the spiciness of the sauce and will bring some sesame oil to cut it. This should be a fun dish. Kinda like watching sea monkeys grow. I hear this was discontinued and would LOVE to know the ingredients for the dressing packet. Any chance you got that? I’m completely bummed as I thought it was fab.